I often associated the word inheritance with hopes and expectations. Somehow, the fantastic Hindi movies had etched it in my mind that it is all about inheriting a piece of land, an expensive heirloom, a coveted name or a mysterious treasure trove. I must admit that the romantic suspense filled thrilling ride of our Bollywood movies had corrupted my mind enough to fall into the sweet honey trap of Alice’s Wonderland and consider life to be as joyous as a happy ending board at the climax promises. 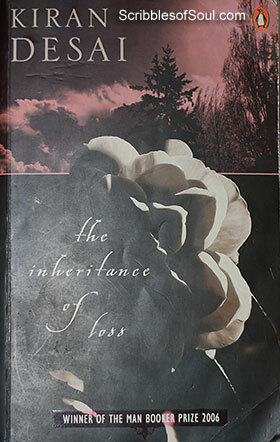 However, the first look of Kiran Desai’s Inheritance of Loss jolted me out of my dream sequence. Here is a story of loss, gloominess, guilt and humongous burden being handed down as a legacy to our poor protagonists. And, in this unique tale, each character shines as a protagonist at selected intervals, as each one of them lives through his or her share of grief and devises novel methods to grow out of their guilt. The entire novel is based upon the responses of these individuals to adverse circumstances, they often find themselves trapped in. And, ironically enough, these are partly their own creations – a collective outcome of years of neglect and ill treatment of innocent people. The Inheritance of Loss is set against the luscious backdrop of Kalimpong in the beautiful North East, during the dreaded Gurkha insurgency in mid eighties. The story revolves around the lives of a retired judge J P Patel, his grand daughter Sai, their cook and Sai’s Nepali tutor turned boyfriend, Gyan. The judge is a stiff lipped, maladjusted, inferiority-complex-ridden product of the famous British Civil Services. His grand daughter Sai is an orphan, who is left alone in a convent by her over-ambitious parents, who are out to carve a new niche in the foreign lands of Russia and meet with a tragic end. She is at last returned to her estranged grand father J P Patel, who accepts the responsibility, grumbling about the cruel fate taking its revenge on him. The cook is a true loyal servant, one who is honest yet clever enough to steal from his master’s kitchen and to make illicit liquor from disbanded items, earning a handsome profit. His only ambition in life is to see his son, Birju rise high, earn oodles of money in the land of opportunities, the world of golden luck – America. It is quite another thing that Birju himself is quite miserable in the dreamland and is desperate to return to his native land, amidst the wide spread poverty and servitude. And, as the story progresses, it becomes apparent that the arrogant judge, innocent Gyan and poor Birju are the victims of the same fate, though they react differently to get rid of their embarrassment. The judge tries to cover up his humiliation under the notorious sham of ego and pretense, Gyan joins the insurgents and hopes that his valor will somehow change his destiny, whereas Birju simply wants to come back to his motherland and draw some solace out of his father’s loving affection. In this novel, Kiran Desai has tried to present the world of immigrants in a hitherto unprecedented manner. She offers a sneak peek into the inner psychological make-up of a poor man – that propels him towards the unknown shores of a far away country. Gives him courage to struggle with strange customs & food, to try hard to settle down in an unfamiliar set-up, to endure humiliation poured over a foreigner by the locals and still not only ensure that he earns the much awaited money and send it home at regular intervals, but also convince his loved ones that all is well, while he is himself falling apart. His own body and soul, unable to take the unnecessary load is breaking down. In this criss-cross tale of irony and fate, where each character at times considers himself to be a loser, the deftness of the author shines through and Kiran Desai has surely won my heart with her superb, sensitive yet direct style. I just loved the way, she introduces her main characters, JP Patel and Sai, by describing a robbery that takes place in their home at the very beginning and their names are first divulged to the readers, as being written on the two suitcases, being carried out by the robbers. This introduction, in a way, represents the very crux of the novel, which is entirely based on the loss of belonging and identity. Though Hullabaloo in Guava Orchard will always remain my favorite, Kiran Desai’s second baby is a winner in itself. Kiran has definitely inherited all the good qualities of her mother and she has indeed, proved her mettle by charting out two entirely different genres in her two novels. I am anxiously looking forward to read her next offering.